As you recall from last week, my husband John, our neighbor Jim and four others will race our sailboat in the Bermuda Ocean Race. This sailboat-only race starts in Annapolis, Maryland and ends 753 miles later at the British island of Bermuda. John has prepared for the race in three parts. First, we have equipped and organized our boat for open ocean racing. Secondly, John and Jim have recruited and trained an outstanding crew. And lastly, John has prepared himself by physically training for the race. I view our Bermuda Ocean Race preparation as a microcosm for preparing for a successful life. Here is why. Like our boat, households must be prepared for success. A cluttered home is a cluttered mind. Be organized and disciplined. The seeds of your success are planted in your household. Success must be able to root and grow in your household environment. Your surroundings must be fertile and able to support you in your efforts to thrive and prosper. Dispose of the old and unused. These items are using up space. Create space in your life for new success by creating space in your household. Success needs room to move in. Secondly, prepare your friends like they are your sailboat racing crew. You are the sum of the people with whom you spend the most time. If your friends are not serving you well, seek other “crew members”. Your “boat” does not have enough room for blamers or permanently pessimistic crew members. People who prosper have good friends. Your friends must be the wind in your sails. If your friends are more like anchors, it is time for their season with you to end. It is likewise with family members. Granted, it is more difficult to avoid family. There are the holiday obligations. But, sharing genetics does not obligate you to share your time. Be aware, guard yourself and take precautions against family that are not good “crew members for your boat”. Lastly, prepare yourself both physically and mentally. Be in good physical condition. Join the Village Health Club. Hire Mary Beth as your personal trainer. Good fitness will fuel your efforts to acquire the life you desire. Successful people maintain high energy levels by staying in good physical condition. Happy people are in good physical condition. Also, prepare mentally. Watch less negative television. Read more and continue learning. I read fifty books a year. John tells people he is concerned our house will collapse under the weight of all the books! Reading activates your imagination. And, be a connoisseur. Those without a developed palate for wine will not be able to discern and enjoy a fine wine. It is likewise for reading. Reading will develop your palate for life. You will be better able to enjoy life and relish your experiences. Learn more by visiting my website at www.AmericasMindsetMechanic.com. View my philanthropic efforts at www.MilitaryKidsSpeak.com. Watch and comment on my interview on Total Christian Television at www.MilitaryKidsSpeak.com/media.php. 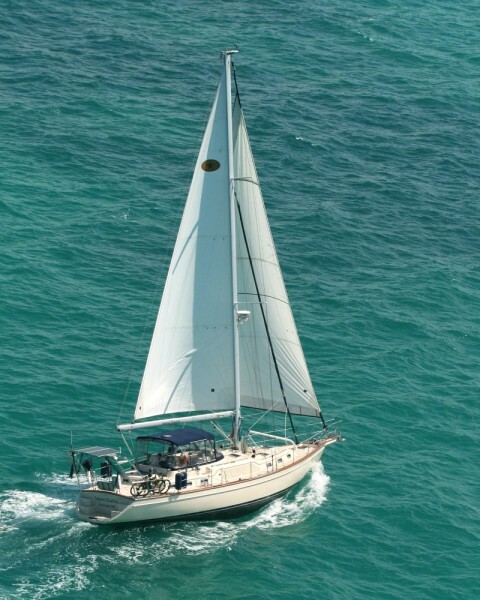 My husband John, with our sailboat, has entered the Bermuda Ocean Race. This sailboat-only race starts in Annapolis, Maryland and ends 753 miles later at the British island of Bermuda. Our neighbor Jim, who has competed in the race nine times, is going to help John captain our boat. Jim has gathered his crew and like the movie Blues Brothers has gotten the “band back together again”. I’m not sure if John or Jim is Elwood or Jake. But, I do know they are on a mission. The race is longer than both the Newport and Marion to Bermuda races. And, sailing down the Chesapeake Bay can be quite challenging. There will be a crew of six men on our boat. It may be a bucket list thing. I am not sure. However, I am sure about the preparation. The preparation has been extremely disciplined. John has prepared for the race in three parts. First, we have prepared the boat. In order to compete, our boat must pass a safety inspection conducted by the race officials. The race officials will board and inspect the boat in Annapolis before the race starts. The inspection checklist is twelve pages long and oriented towards the worst case scenarios. In addition, we have purchased some extra safety equipment that was a good idea but not required. As an understatement, we now have a well-equipped boat. The second part of the preparation was training the crew to manage the boat. John and Jim held a training weekend. Two of the crew flew in from Massachusetts. The other two flew in from Pennsylvania. During the recent training weekend, John and Jim conducted school on the boat systems. There were man overboard drills, storm sail handling drills, and of course some practice racing. John has written some exhaustive guides to help familiarize the crew with our boat. It is important that all understand the expectations and are good teammates. The third part of the preparation has been the personal training. John has joined the Village Health Club and hired Mary Beth as his trainer. John trains hard in the Club and Mary Beth pushes him to go even further. In three short months, with Mary Beth as his trainer, the change has been dramatic. John has lost weight and is now in excellent shape. His body is now suitable for an extended open ocean race. Through all this, it has occurred to me that John’s preparation for the Bermuda Ocean Race is a microcosm for a successful life. We have prepared our boat, our crew, and ourselves for the race. Even more important, for a happy and successful life, we must prepare our household, our friends and each other. Read my column next week. I will expound on this preparation philosophy and give you some keys to unlock your success. Learn more by visiting my website at www.AmericasMindsetMechanic.com. View my philanthropic efforts at www.MilitaryKidsSpeak.com. At the tender age of seventeen, Edward Smith joined his half-brother who was the captain of the sailing ship Senator Weber. Later Smith joined the White Star Line as the Fourth Officer of the SS Celtic. Smith served on the White Star ocean liners to Australia and New York City. He served with distinction and earned his first command, at age 37, on the ocean liner Republic. Later, Smith served in the Boer War as the captain of the Majestic. The Majestic was called into action transporting troops to South Africa where Smith earned the “Transport Medal” awarded by King Edward VII. Interestingly, the ocean liners that Smith commanded were able to fly the special Blue Ensign flag since Captain Smith was a member of the Royal Naval Reserve. As Captain Smith gained seniority, his reputation grew. He was known as the “Millionaires’ Captain” because the English wealthy usually chose to sail only on the ships he commanded. Smith was the world’s most experienced sea captain. He always commanded the White Star Line’s newest ships on their maiden voyages. Captain Smith commanded the maiden voyages of the Baltic, Adriatic and Olympic. And, of course, his last maiden voyage was on the ocean liner Titanic. Now you know! Edward Smith was 62 years old when he perished along with 1,502 others. He had 45 years of experience at sea, roughly 73-percent of his life. When the Titanic sunk in April 1912, there was no better sea captain in the world than Captain Edward Smith. The Titanic hit an iceberg and sank with total disregard for the experience of her captain. So, what is my point? My point is the Titanic did not know or care who was in command. The ship did not have any inherent respect for her Captain. It did not matter to the ship who was in command. The ship had no deference for Captain Smith’s experience. Likewise, the inanimate objects in your life have no respect for you. Your car, lawnmower, motorcycle or boat has no deference for you! Ownership or command of an object does not lessen the potential for an accident. Making car payments will not gain you any respect from your car. Your car does not care that you are the one making the payments. Run a red light and you risk an accident just the same. And, even though your motorcycle or boat might be your prized possession, they do not feel the same way about you. Your possessions do not care and will injure you just the same, quickly and without prejudice. There is no reciprocity in your relationship with your prized possessions. So, with summer approaching, my mindset message this week is “be care-full” this season. Be mindful of the consequences of carelessness. Practice a measure of personal risk reduction and accept no unnecessary risk. Furthermore, multitasking is a myth. Be focused and present when accomplishing your tasks. Are you still curious? Visit my website at www.AmericasMindsetMechanic.com. Custer’s last stand was a battle between the Seventh Cavalry Regiment and the combined tribes of the Lakota, Northern Cheyenne and Arapaho Indians. The battle took place near the Little Big Horn River in Montana. It was the most famous battle of the Great Sioux Indian War and took place on the 25th and 26th of June 1876. There were roughly 1800 Indians. Lieutenant Colonel Custer’s battalion numbered roughly 650 soldiers. Of course, the battle was an overwhelming victory for the Indians. The U.S. Seventh Cavalry, including the Custer Battalion, suffered a severe defeat. Five of the Seventh's companies were annihilated; Custer was killed, as were two of his brothers, a nephew, and a brother-in-law. Total U.S. deaths were 268, including scouts, and 55 were wounded. Estimates place the Indian deaths at 136 with 168 wounded. So it is with life. It is not people that cause upset. It is our reaction to the arrows they shoot in our direction. It is the effect of what they say and do that causes the angst in our peaceful routine. To some, it seems the arrows are always flying towards them. They are battling their way through life. I advocate a strong defense. And, a strong defense starts with recognition. Recognize the arrow for what it is. Then, neutralize the arrow by remembering the earliest time you felt the same way. Choose to either avoid the antagonists or neutralize their effect on you. Do not continue to stand in the line-of-fire. If the offender is a friend, perhaps a new friend would serve you better. It is okay to allow a friendship that is not serving you well to fade away. If the offender is a family member, avoidance might be more difficult but still possible. So take a lesson from Lieutenant Colonel Custer, avoid the arrows by avoiding the Indians in your life. And, if you would like help, contact me through my website at www.AmericasMindsetMechanic.com.